- Page 5 of 10 - It's not the destination... it's the journey. 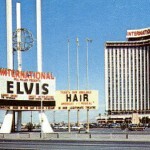 The Story of Classic Las Vegas is a wonderful website resource for those interested in what the town was like before the computers and the corporations took over. Its recent post about the legendary Foxy’s Deli across the street from the old Sahara Hotel & Casino brought back many memories. For someone, like myself, whose stories are based in that now-lost world, the text and photos regularly inspire my imagination. The Landmark Hotel & Casino at the corner of Paradise Road and Convention Center Drive was a major gamble undertaken by a Kansas City contractor and his financiers. Its construction began in 1961 but funding was cut off in December of 1962. It sat unfinished for years, towering over the nearby Convention Center and its rotunda. A Teamsters Union Pension Fund loan in 1966 permitted construction to resume, but the resort remained unfinished until it was acquired by Howard Hughes in 1969. Hughes, residing in isolation on the top floor of the Desert Inn’s high-rise, turned all his attention to remodeling the Landmark and opening it in competition with his rival Kirk Kerkorian’s new International Hotel & Casino on the other side of Paradise Road.